As an avid gym-goer and fitness enthusiast, I have faced many obstacles trying to stay fit in foreign countries. From the Middle East to Africa to South America, I have found ways of exercising without losing exploration time. With some extra planning and self-discipline, you can easily workout while abroad. Below, I will share some personal experiences and tips so that you may do the same. Find a gym. Find a park. Use your bedroom floor. Look at their website, map out the route and trek it by foot/bike/taxi. If you're just vacationing or living in an apartment-style place like I did in Malawi, you may even get a place with a gym. While in Jordan, Morocco, Colombia and Mexico I simply looked up gyms near me and walked there. Before arriving, I planned out my negotiation speech in Arabic and Spanish and did my best to get in for free. I was able to do this a number of times before purchasing day, week or monthly passes. Say that you are looking into buying a membership with them, but would like to use the facility first before making a decision. Be confident, but kind. You will be surprised with what you can get with a little compromise. Keep in mind that gender segregation is still very common in many countries. Gyms and Sports Clubs may be influenced by cultural norms. You may be able to work out a deal with the managers. For example, in Jordan, I found a great gym in Amman. 'Power Hut' allowed me to workout on both the male and female floors after some negotiating. The price was a bit expensive, though. Morocco was much more difficult. During my semester in Meknes, I probably went to six different fitness facilities. The gyms were either separated into gendered areas or the schedule was allocated into men's and women's gym time. There were many instances when I would show up after walking miles to get to this particular gym and was turned away because it was 'mens time'. (Sigh. Eye roll) When is it NOT "mens time" in Morocco? I found that fitness in Morocco hadn't quite caught up with modern times. Most female gyms included an elliptical or treadmill that you were only allowed to be on for 10 minutes or so and a few plastic dumbbells weighing roughly 2 pounds. I decided to try some cardio classes with my homestay mom. I figured it would be something similar to Zumba, BodyPump, etc... Well, not quite. These classes were taught in a little studio that was closed off to men so that women would be safe to take off their hijabs in the company of other women. The class included lots of movements that go against everything I've ever learned about proper form and safety and we would occasionally use those plastic "dumbbells" that weigh as much as a cell-phone. I had to get creative. Which brings me to my next point. Running. Yes, I said running. The weight-lifters worst nightmare. However, running requires no equipment and has some of the best stress-relieving benefits. Although it is not culturally appropriate or safe to run the neighborhood in some countries, you can almost always find a park, trail or track. In Colombia, I was on a budget and didn't want to pay for a gym pass every day. 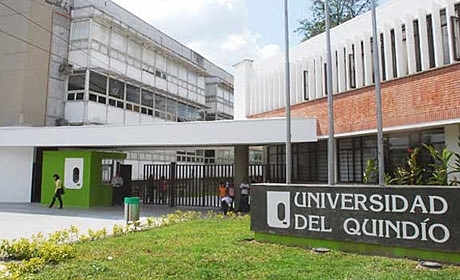 Instead, I walked down to the Universidad Del Quindio campus and did sprints around the track. In Morocco, there was a public pond area that I ran laps around for a grueling 45 mins to an hour. There was also a public garden park that many people ran and exercised at. The University that I was able to utilize the track field for sprints instead of buying a gym pass everyday. The public park that I would run laps around for almost an hour. At least this beautiful sunset made the run much more tolerable. There are many great apps that will run you through a workout with minimal to no equipment. I have used fitness applications many times in Morocco, Colombia and trips around the U.S. They are simple and a great way to workout quickly, especially if you're broke a'f. I recommend the Nike Training Club app. It will allow you to create a training plan and download the workouts so you can use it with or without wifi. You can also choose the length of the workout in case you were just trying to work off a few extra exotic calories. Another great app I love is Down Dog. It's a Yoga app, but it has a variety of difficulty levels and sequence types. You can also choose the length of the workout. Yay!